In 1933 Reza Shah signed a deal selling Iranian oil extraction rights to the Anglo-Persian Oil Company, later called British Petroleum (BP). Though Iran was officially neutral at the start of World War II, its monarch was friendly towards the Axis. Following the 1941 Allied Invasion of Iran, Reza Shah was forced to abdicate in favour of his son Mohammad Reza Shah, who upheld the oil agreement with APOC, which by then had been renamed the "Anglo-Iranian Oil Company". When the first democratically elected parliament and prime minister in Iran took power in 1950 they planned to seize the oil assets in Iran that had been developed by the British, violating the still running oil contract with British Petroleum. The British government followed to court in Belgium's International Court, lost the case against Iran's new government and reacted by blockading the Persian Gulf, the Strait of Hormuz, halting Iran's trade and economy. The US was concerned that Iranian Prime Minister Mohammad Mosaddegh was seeking help from the local superpower, the Soviet Union, against Britain. The Eisenhower administration agreed with British Prime Minister Winston Churchill government to restore the pro-Western Shah to power. In the summer of 1953, the CIA and Britain's MI6 arranged a coup in Tehran. Mossadegh was successfully overthrown and spent the rest of his life on his country estate under house arrest, and Iran remained a staunch Cold War ally of the West. After more than 20 years of the Shah's rule, there was a bloody revolution in 1979 and brought into power an Islamic republic, which has ruled ever since. Regarding US policy as it developed towards Iran in the early 1950s, the book portrays it as having been variously driven by the fear of annoying the British, an attempt to be an honest broker, or an effort to stop the spread of Communism. 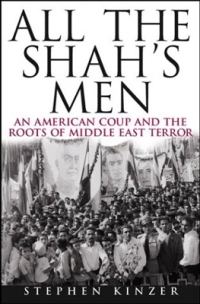 The fact, stated at the end of the book, that US companies were granted the majority of the oil concessions from the Shah's government after the coup, does not feature significantly in the earlier part of the narrative. However, that it was the chief reason for the coup is the tacit conclusion of the book. British critic David Pryce-Jones takes strong issue with this conclusion in his essay "A Very Elegant Coup" (link below). In his view, the attempted Communist takeover of Iran was the chief issue, and the portrayal of the CIA by Kinzer as "arrogant, thuggish and immoral" was originally a notion put forward by leftists who sympathized with the attempt. This page is based on the Wikipedia article All the Shah's Men; it is used under the Creative Commons Attribution-ShareAlike 3.0 Unported License (CC-BY-SA). You may redistribute it, verbatim or modified, providing that you comply with the terms of the CC-BY-SA.